I like visiting churches, and particularly the old ones. Not only are they an ideal place to rest for a few minutes, but they charge my spiritual batteries, allow me to cool down from the heat of the sun and teach me quite a lot about the people that live and worship within the local community. Until recently, I have rarely considered the physical positioning of church buildings, and always assumed that much was subject to the availability of suitable land, as well as the positioning of other buildings and natural features. In other words, I have assumed that most churches were built more by accident rather than focussed design. A recent study in the Canary Islands has made me realise that there is much more to the subject and, once again, reminded me that the trade winds had, and continue to have, an important part to play in the history and development of these islands. The trade winds have both a positive and negative impact upon everything in the Canary Islands. The shape of the volcanoes, climate, the guiding of sailing boats and the natural cycles that enrich the Atlantic Ocean are all affected by the trade winds, which many refer to as “the Motor of the Atlantic Ocean”. Mariners have used and relied upon them for centuries for reliable and swift sailing. Surprisingly, the trade winds may also have determined how churches were originally built in the Canary Islands. Three researchers from the Institute of Astronomy and Space Physics of Buenos Aires, the Institute of Astrophysics of the Canary Islands and the Institute of Heritage Sciences of Santiago de Compostela have carried out a very interesting study of 32 churches across the Canary Islands and have recently reported their findings. Most Christian churches in Europe were for centuries built with an orientation that would allow the priest to look to the east when officiating at the Mass. This instruction came from the first Council of Nicea in 325 AD. In most churches, the altar is aligned to the point where the sun rises, which followed the advice given by Saint Athanasius of Alexandria in the Fourth Century, which was designed to allow worshippers to hear the Mass whilst facing the sun. Later, Church law stated that church buildings must observe the principles and norms of the Bible and sacred art, so that many churches have their nave facing east or towards the point where the sun rose on the day of the year when its foundations were laid. This practice was followed in almost all Christian churches in the world, with the exception of those in North Africa, where churches tend to face west. Current researchers wanted to discover if this North African custom could be seen in the first Christian churches of the Canary Islands, because of the influence of the aborigines of the islands, who descended from the Berber villages of North Africa. 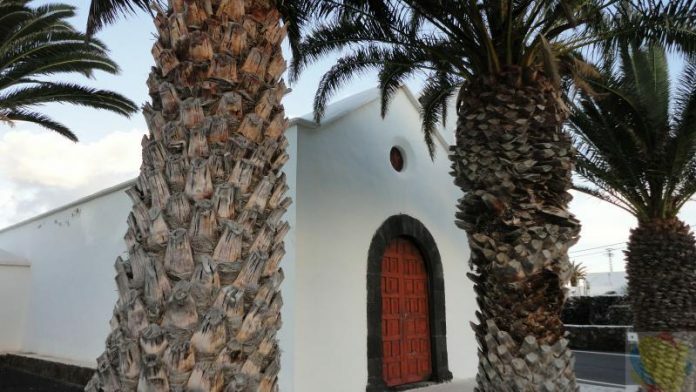 They examined the orientation of churches in Lanzarote, the island where the European presence is older and goes back almost a century before the conquest of Gran Canaria or Tenerife was completed. The research findings were surprising, since the orientation of the oldest churches of Lanzarote does not show a clear influence of the aboriginal culture that can be attributed to ancient cults of these people, or their knowledge of astronomy. This was particularly interesting, because several pre-Hispanic sites across the Canary Islands mark the sunrise in the solstices and equinoxes, which allowed aboriginal societies to have a calendar for rituals, sowing and harvesting. Of the thirty-two churches analysed, all were built between the Sixteenth and Nineteenth Centuries. Seventeen are positioned to face east at sunrise, one is almost exactly aligned with the equinoxes (Nuestra Señora de las Mercedes in Mala) and two more were built in reverse, looking west. However, twelve were aligned to face in a north-north easterly direction. These researchers conclude that this peculiarity of Lanzarote churches is unique in all of Europe. They suggest that it is a compromise response to a cultural combination of beliefs of the aborigines and the faith of their conquerors. Some churches in the Canary Islands show a marked difference to the orientation of nearly all Christian churches across the world and could have been influenced by the direction of trade winds that were so important to the aboriginal people living in these islands. So, next time that you visit a church in the Canary Islands, do take a compass with you.